The biggest problem with gardening gloves is that quite often they don't fit properly even when they come in separate sizes for men and women. As a result of this (and in general) they can be uncomfortable to wear, often feeling heavy and awkward to move hands freely which can in turn make gardening more difficult than it needs to be. And what's more - they aren't always the most attractive of gloves! This is where Jayco, a family-owned and managed company, spotted a gap in the market for much-needed innovative gardeners' gloves; and so in 2004 Jayco launched the Gold Leaf Gardening Glove range. 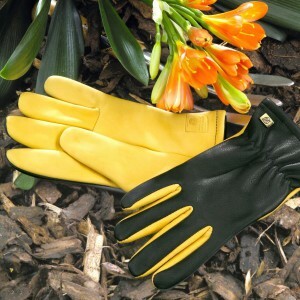 The Gold Leaf Gardening Glove range solve all of the problems posed by standard gardening gloves as a result of a combination of innovative designs, high-quality leather and constant perfecting of styles and packaging. 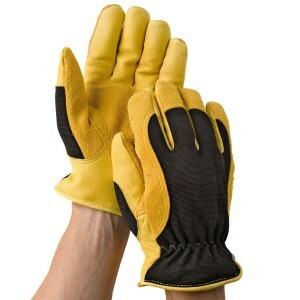 They are comfortable, are an excellent fit and make it easier and more enjoyable to complete gardening tasks. 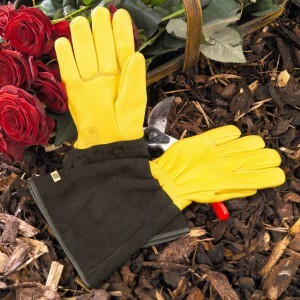 The Gold Leaf Gardening Glove range has been so successful that they were awarded 'The RHS Chelsea Sundries Trophy' at the RHS Chelsea Flower Show in 2005. The range is now used by the most professional gardeners at Wisley, Rosemoor and Harlow Carr. Gold Leaf Gardening Gloves are now attractively adorned with the RHS logo, having been endorsed by the Royal Horticultural Society - the ultimate sign of quality in the garden! As an extra special offer we are providing free delivery* on any purchase of Gold Leaf Gloves from our website! The Soft Touch™ Gardening Glove offers an extremely close fit as well as excellent durability. 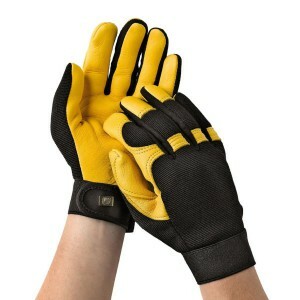 The palm of the gloves are made from high quality grain leather which is used for its softness and flexibility. The back of the glove is made from Lycra, nylon and foam, which with the Velcro fastening make the close, tight fit which helps differentiate this from other Gardening Gloves. These gloves are all about the feel and fit, and will suit those in search of a robust, comfortable multi-purpose Gardening Glove, with a touch of style. The Winter Touch™ Gardening Glove is a unique, hardwearing, yet luxurious glove for use in cold or wet conditions. These gloves feature a Thinsulate™ thermal lining to keep hands warm even in the coldest weather, as well as an additional innovative Ski-Dri™ waterproof, breathable lining which ensures hands remain totally dry when used in wet conditions. The reinforced palm of this glove also makes it ideal for use with rakes, spades, brushes and a whole array of other gardening tools. Through its unique design, the Tough Touch™ Gardening Gloves offer a high level of protection against thorns and alike, whilst retaining an incredibly soft feel which results in very unusual dexterity for a glove so robust as this. This glove also offers exceptional comfort and warmth, with the added benefit of the gold grain leather having been specially treated to offer resistance to water. The extended cuff provides additional protection for the wrist and forearm. The Dry Touch™ Gardening Gloves are very comfortable and durable gloves which have been constructed using a softer, extremely flexible grain leather. These gloves have also had the leather specially treated to provide resistance to water, and would therefore be ideal for those seeking a glove to use in wetter conditions. Additionally, this glove features a full lining throughout for extra warmth and comfort. The Dry Touch™ is suitable for a variety of gardening purposes, such as potting, weeding and light pruning. *Free delivery only applies when purchasing Gold Leaf Gloves. Offer will not apply when purchasing any other goods aswell - sorry!